The Men's Oxygen Jersey's comfort and innovative pocket design puts it head and shoulders above the rest. Made from a lightweight fabric that stretches to move with you and wicks moisture excellently, this jersey is comfortable for full days riding. This jersey also features an innovative pocket design which supports the three rear pockets with backpack panels, preventing sagging while fully loaded and avoiding swaying due to rider movements. Additional features include an ergonomic collar, full length zipper, reflective logos, and mesh venting. 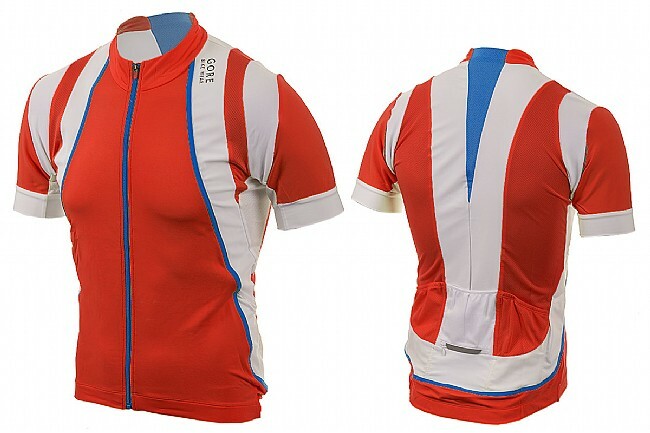 The Men's Oxygen Jersey is available in various colors and features a tight, athletic fit. I originally bought this jersey for two reasons The price was great and the name GORE is just plain cool. The redblack color scheme really helps, too. I think it looks cool as hell. I'm considering ordering what appears to be the last two from you guys when I have the spare money! Anyway, I'm a 5 foot 9 inch, 145lb cyclist. I'm very thin and the small size fits me perfectly. It's almost a race fit. It's tight, but non restricting. It breathes very well, and it extremely durable! I ordered mine about 2 years ago and it still looks and fits in such a fantastic way. It stretches very well and I haven't had to deal with any ripping or anything of the sort. It fits a bit more loose than around the bottom, but it's nothing that's bad. I like it, honestly, as I feel it ads to the non-restrictive feel of the jersey. The jersey pockets are all very impressive. You have the standard 3 pockets, plus a zipper pocket that lines the main center pocket (4 pockets) and two small, thin and tall pockets that flank the two outside pockets. That totals to six pockets! The two small pockets are perfect for fitting my small hand pump, small tools, gels or anything else you might want to pack into it! The bigger pockets expand to fit a lot! When going up GMR or Mt. Baldy, I can pack 2 bottles on my bike, one in my center pocket, my id, money and phone in the zipper pocket, my pump in a side pocket, my tubes, tire levers and tools can go in one of the pockets next to the bottle and I can pack plenty of nutrition in the other pocket flanking the center pocket with a bottle in it. I usually pack a cliff bar, two or four gels (you never know when a buddy might need one) and a banana in that pocket. I've never had a thing pop out of the pockets on a ride and i've never had a pocket rip. Overall, I'd say to buy this jersey. Just do it. Trust me. Hurry, before I buy the last two. Comfortable, snug fitting jersey with 6 pockets! Great jersey. I'm 5'10, 135 pounds and the Small fits nice and snug, even in the sleeves. The narrow side pockets allow me to store my Lezyne pump there. This jersey has 6 pockets! One negative point the waist of the jersey is not loose, but it should be tighter than it is. I plan to buy more. Great jersey, true to size, great price. Gore makes great products and that includes this jersey. Nice fit and colors. Great jersey, excellent materials and construction. I followed the sizing on Western's site and looked at sizing recommendations on Gore's site, both suggested L. L was definitely too small. Easy return through Western's superior customer service, XL is spot on. Nice long distance features without the Bling. I use my gore jersey on longer forty to fifty mile rides where I need to carry additional water. The reinforced panels are designed to carry bulky items, which in my case means a pint water bottle on each side to keep me hydrated without having to stop and buy drinks. Gore products are well made and don't carry large logos, which is kinda nice when you don't want to be all blinged out in manufactures colors.